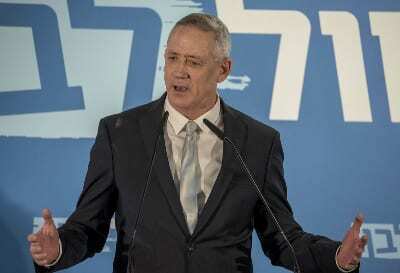 A poll conducted at the beginning of the week after several right-wing parties joined into a block and after Benny Gantz’s Israel Resilience and Yair Lapid’s Yesh Atid merged into the Blue and White party shows that Gantz will not be Israel’s next prime minister. A jointly commissioned i24NEWS-Israel Hayom poll published on Sunday shows that Blue and White would receive 36 seats, and Prime Minister Benjamin Netanyahu’s Likud party would get 31 seats. However, Netanyahu would be able to form a 62 seat coalition with the religious and right-wing parties. On the other hand, Lapid and the Arab parties have already expressed their mutual rejection, while the two Ultra-Orthodox parties have declared they would not set in a government together with Lapid over his anti-religious policies. The party that forms the government is determined by the recommendations of each elected party. The party to receive the most recommendations forms the government, and not necessarily the party that gets the most votes. Netanyahu is projected to receive the most recommendations. This article shows a woeful ignorance of Israeli political parties and the Israeli election scene. 1. Netanyahu would … 62 seats: This assumes that Netanyahu would join with Otzma LeYisrael candidates after the election. Not a forgone conclusion as even the Jewish Home and the National Union don’t want to stay joined with Otzma LeYisrael after the election. 2. The party to receive the most recommendations forms the government: Not exact enough. The president receives recommendations from the elected political parties. Then the president assigns the task of forming a government to the party leader who has the greatest chance of establishing a coalition. While the president does take the recommendations of the parties into consideration, the president is not required to accept the recommendations. 3. The Arab parties Ta’al and Hadash: Hadash is not a Arab party. Hadash is a left-wing party that supports a communist economy and workers’ rights. 5. Netanyahu would … 62 seats: I presume this is also supposed to indicate that the Blue and White party could only put together a coalition of 58. The reality is that the Blue and White party does not have to form a coalition of the Left. In fact, if they do get the largest number of seats in the election, they could easily create a very simple and relatively stable coalition of the center. They could link with a post-Netanyahu Likud (and if they wanted to with Labor and Kulanu (if Kulanu eventually passes the threshold)) and in this way the Blue and White party comes out in front in the election. Finally, if Netanyahu is indicted before the election, a post-Netanyahu Likud after the elections is quite a possibility.